Overdraft fees along with non-sufficient funds fees have become a huge source of revenue for banks and credit unions over the last several years. According to the Center for Responsible Lending (CRL), “…banks and credit unions collected nearly $24 billion in overdraft fees in 2008. These overdraft fees represented an increase of 35% from two years earlier.” The $24 billion in revenue does not include an additional $10 billion collected in non-sufficient fund fees. Consumers may not be aware they are enrolled in a bank’s debit card overdraft coverage program. And that is no mistake. Most bank customers have not been explicitly told they are automatically enrolled. The debit card overdraft coverage differs from the bank or credit union’s traditional overdraft protection program. In traditional overdraft protection programs customers apply for the overdraft protection which is linked to a savings account, credit card or home equity line of credit. Customers are aware when an overdraft occurs on their checking account, funds are automatically transferred from a savings, credit card or home equity account to cover the transaction. Not only are banks racking up profit in overdraft fees which average $34.00 per transaction (according to CRL), they may be deliberately causing them. Delaying posting customer deposits and rearranging customer purchases from the largest to the smallest to generate multiple overdrafts is common practice. The problem with processing higher transactions first is this: Your checking account balance is $240.00. You write a check for $220.00; purchase gas for $25.00; make a drugstore purchase for $15.00; and get a Starbucks coffee for $3.50. The charges may all come in on the same day and the bank decides to clear the largest transaction of $220.00 first. That would leave a balance of $20.00 and the subsequent 3 transactions may clear; but, with a $35.00 overdraft fee for each which totals $105.00. Had the bank cleared the lowest transactions first there would have only been one $35.00 overdraft fee for the highest remaining transaction. The simple thing to do would have been for the bank to decline the debit card purchases if there were not sufficient available funds. Although the customer would not be able to make the purchase, no fee would have been incurred by the customer. I am sure most people would rather be turned away than end up paying $38.50 for a $3.50 cup of coffee. On July 1, 2010 a new rule will go into effect from the Federal Reserve. 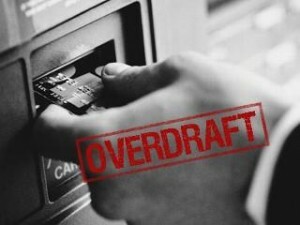 Consumers will have to “opt-in” to overdraft coverage for ATM withdrawals and one-time debit card transactions. Consumers will have to consent or opt-in before a financial institution can automatically cover a customer in overdraft protection. New and existing bank customers must be provided a notice which explains the financial institution’s overdraft services and any fees associated with the service. Several banks such as Bank of America, JP Morgan Chase, Wells Fargo are currently offering customer’s an opportunity to Opt-Out of the overdraft protection in anticipation of the Federal Reserve’s new regulation. Check with your bank or credit union and see if you can opt-out of their automatic overdraft coverage service.